The term is also used as a verb, to describe carbonation: the process of raising the concentrations of carbonate and bicarbonate ions in water to produce carbonated water and other carbonated beverages –either by the addition of carbon dioxide gas under pressure, or by dissolving carbonate or bicarbonate salts into the water. Carbonated water or soda water is water containing dissolved carbon dioxide gas, either artificially injected under pressure or occurring due to natural geological processes. Carbonation causes small bubbles to form, giving the water an effervescent quality. Common forms include sparkling natural mineral water, club soda, and commercially produced sparkling water. Geology is an earth science concerned with the solid Earth, the rocks of which it is composed, and the processes by which they change over time. Geology can also include the study of the solid features of any terrestrial planet or natural satellite such as Mars or the Moon. Modern geology significantly overlaps all other earth sciences, including hydrology and the atmospheric sciences, and so is treated as one major aspect of integrated earth system science and planetary science. y for some integers x, y, and n.
Lewis structures, also known as Lewis dot diagrams, Lewis dot formulas,Lewis dot structures, electron dot structures, or Lewis electron dot structures (LEDS), are diagrams that show the bonding between atoms of a molecule and the lone pairs of electrons that may exist in the molecule. A Lewis structure can be drawn for any covalently bonded molecule, as well as coordination compounds. The Lewis structure was named after Gilbert N. Lewis, who introduced it in his 1916 article The Atom and the Molecule. Lewis structures extend the concept of the electron dot diagram by adding lines between atoms to represent shared pairs in a chemical bond. In chemistry, resonance is a way of describing bonding in certain molecules or ions by the combination of several contributing structures into a resonance hybrid in valence bond theory. It has particular value for describing delocalized electrons within certain molecules or polyatomic ions where the bonding cannot be expressed by one single Lewis structure. Metal carbonates generally decompose on heating, liberating carbon dioxide from the long term carbon cycle to the short term carbon cycle and leaving behind an oxide of the metal. This process is called calcination, after calx, the Latin name of quicklime or calcium oxide, CaO, which is obtained by roasting limestone in a lime kiln. In aqueous solution, carbonate, bicarbonate, carbon dioxide, and carbonic acid exist together in a dynamic equilibrium. In strongly basic conditions, the carbonate ion predominates, while in weakly basic conditions, the bicarbonate ion is prevalent. 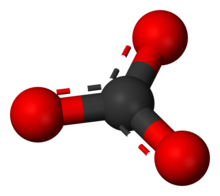 In more acid conditions, aqueous carbon dioxide, CO2(aq), is the main form, which, with water, H2O, is in equilibrium with carbonic acid –the equilibrium lies strongly towards carbon dioxide. Thus sodium carbonate is basic, sodium bicarbonate is weakly basic, while carbon dioxide itself is a weak acid. It works as a buffer in the blood as follows: when pH is low, the concentration of hydrogen ions is too high, so one exhales CO2. This will cause the equation to shift left,[ further explanation needed ] essentially decreasing the concentration of H+ ions, causing a more basic pH. It is generally thought that the presence of carbonates in rock is strong evidence for the presence of liquid water. Recent observations of the planetary nebula NGC 6302 show evidence for carbonates in space,  where aqueous alteration similar to that on Earth is unlikely. Other minerals have been proposed which would fit the observations. The common-ion effect states that in a chemical solution in which several species reversibly associate with each other by an equilibrium process, increasing the concentration of any one of its dissociated components by adding another chemical that also contains it will cause an increased amount of association. This result is a consequence of Le Chatelier's principle for the equilibrium reaction of the association/dissociation. The effect is commonly seen as an effect on the solubility of salts and other weak electrolytes. Adding an additional amount of one of the ions of the salt generally leads to increased precipitation of the salt, which reduces the concentration of both ions of the salt until the solubility equilibrium is reached. The effect is based on the fact that both the original salt and the other added chemical have one ion in common with each other. In chemistry, neutralization or neutralisation is a chemical reaction in which an acid and a base react quantitatively with each other. In a reaction in water, neutralization results in there being no excess of hydrogen or hydroxide ions present in the solution. The pH of the neutralized solution depends on the acid strength of the reactants. 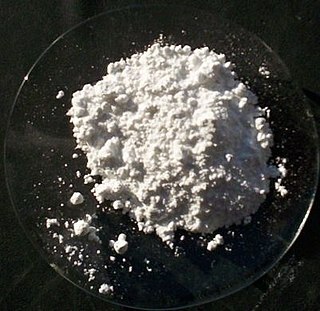 Neutralization is used in many applications. Limescale is a hard, off-white, chalky deposit often found in kettles and hot water boilers and on the inside of hot water pipework. It is also often found as a similar deposit on the inner surfaces of old pipes and other surfaces where "hard water" has evaporated. Alkalinity is the capacity of water to resist changes in pH that would make the water more acidic. Alkalinity is the strength of a buffer solution composed of weak acids and their conjugate bases. It is measured by titrating the solution with a monoprotic acid such as HCl until its pH changes abruptly, or it reaches a known endpoint where that happens. 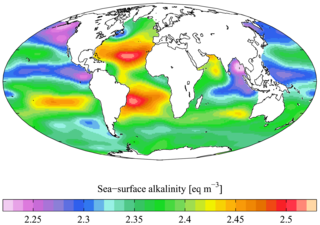 Alkalinity is expressed in units of meq/L, which corresponds to the amount of monoprotic acid added as a titrant in millimoles per liter. 3) ions, together with dissolved carbon dioxide (CO2). The relative concentrations of these carbon-containing species depend on the pH; bicarbonate predominates within the range 6.36–10.25 in fresh water. Alkali, or Alkaline, soils are clay soils with high pH, a poor soil structure and a low infiltration capacity. Often they have a hard calcareous layer at 0.5 to 1 metre depth. Alkali soils owe their unfavorable physico-chemical properties mainly to the dominating presence of sodium carbonate, which causes the soil to swell and difficult to clarify/settle. They derive their name from the alkali metal group of elements, to which sodium belongs, and which can induce basicity. Sometimes these soils are also referred to as alkaline sodic soils. 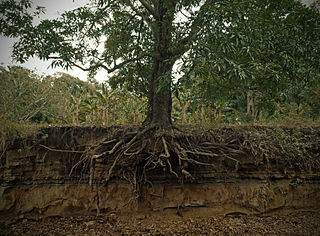 Alkaline soils are basic, but not all basic soils are alkaline. The dealkalization of water refers to the removal of alkalinity ions from water. Chloride cycle anion ion exchange dealkalizers remove alkalinity from water. The residual sodium carbonate (RSC) index of irrigation water or soil water is used to indicate the alkalinity hazard for soil. The RSC index is used to find the suitability of the water for irrigation in clay soils which have a high cation exchange capacity. When dissolved sodium in comparison with dissolved calcium and magnesium is high in water, clay soil swells or undergoes dispersion which drastically reduces its infiltration capacity. Oilfield scale inhibition is the process of preventing the formation of scale from blocking or hindering fluid flow through pipelines, valves, and pumps used in oil production and processing. Scale inhibitors (SIs) are a class of specialty chemicals that are used to slow or prevent scaling in water systems. Oilfield scaling is the precipitation and accumulation of insoluble crystals (salts) from a mixture of incompatible aqueous phases in oil processing systems. Scale is a common term in the oil industry used to describe solid deposits that grow over time, blocking and hindering fluid flow through pipelines, valves, pumps etc. with significant reduction in production rates and equipment damages. Scaling represents a major challenge for flow assurance in the oil and gas industry. Examples of oilfield scales are calcium carbonate (limescale), iron sulfides, barium sulfate and strontium sulfate. Scale inhibition encompasses the processes or techniques employed to treat scaling problems. 1 2 3 4 International Union of Pure and Applied Chemistry (2005). Nomenclature of Inorganic Chemistry (IUPAC Recommendations 2005). Cambridge (UK): RSC–IUPAC. ISBN 0-85404-438-8. Electronic version. 1 2 Chisholm, Hugh, ed. (1911). "Carbonates" . Encyclopædia Britannica (11th ed.). Cambridge University Press. ↑ Kemper, F., Molster, F.J., Jager, C. and Waters, L.B.F.M. (2001) The mineral composition and spatial distribution of the dust ejecta of NGC 6302. Astronomy & Astrophysics394, 679–690. ↑ Squyres, S. W.; et al. (2007). "Pyroclastic Activity at Home Plate in Gusev Crater, Mars". Science. 316 (5825): 738–742. Bibcode:2007Sci...316..738S. doi:10.1126/science.1139045. PMID 17478719. ↑ Squyres, S. W.; et al. (2006). "Overview of the Opportunity Mars Exploration Rover Mission to Meridiani Planum: Eagle Crater to Purgatory Ripple". Journal of Geophysical Research: Planets. 111 (E12): n/a. Bibcode:2006JGRE..11112S12S. doi:10.1029/2006JE002771.